"Welcome to the big time, boys!" Paramount has debuted the first official trailer for Richard Linklater's Everybody Wants Some, formerly known as That's What I'm Talking About, a comedy following a group of baseball players growing up. This is Richard Linklater's follow-up to Boyhood and a sort-of sequel to Dazed and Confused. It definitely has that vibe. The cast features mostly up-and-coming actors including: Zoey Deutch, Glen Powell, Tyler Hoechlin, Ryan Guzman, Wyatt Russell, Dora Madison, Blake Jenner and Jonathan Breck. This looks great, can't wait to see it. My only WTF question - how are there so many quotes from reviews not yet published for a film still four months out from release? Very odd. Anyway - enjoy it! A group of college baseball players navigate their way through the freedoms and responsibilities of unsupervised adulthood. The film is said to be a spiritual sequel to Dazed and Confused. 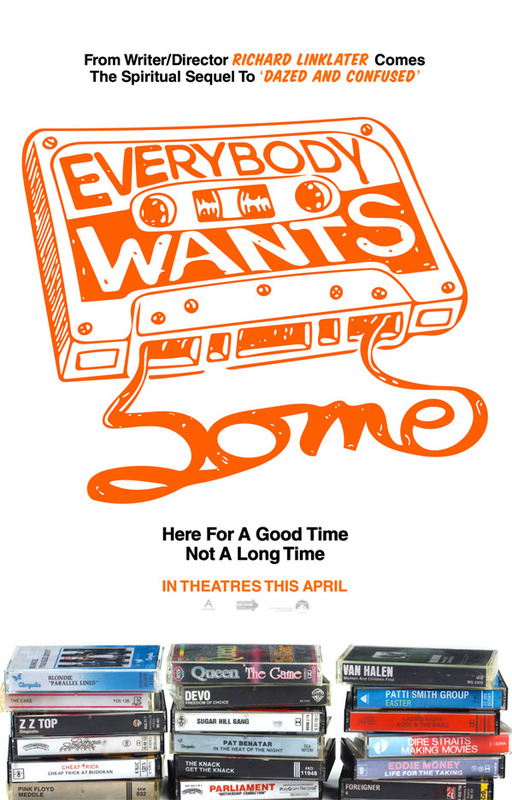 Everybody Wants Some, formerly known as That's What I'm Talking About, is both written and directed by veteran American filmmaker Richard Linklater, director of the films Boyhood, Before Sunrise / Sunset / Midnight, Bernie, Me and Orson Welles, Fast Food Nation, School of Rock, Waking Life, Dazed and Confused, and Slacker previously. Annapurna Pictures helped produce the film. Paramount Pictures will release Everybody Wants Some in theaters everywhere starting April 15th, 2016 next spring. Stay tuned for more updates. You in? Love Linklater and Dazed is a classic from start to finish, here's hoping this trailer doesn't reflect the quality of the film..
Linklater is always ready with a curveball. I am sure there is some cheeky clue or something with those cassette selections.